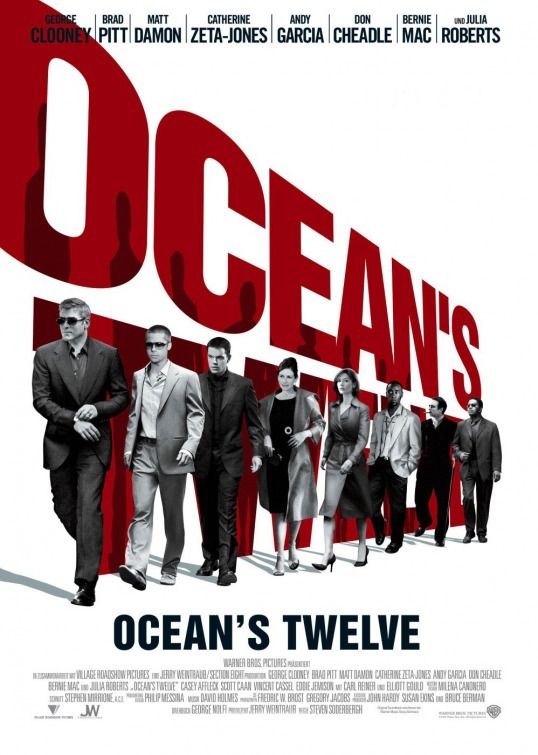 I fully expect a bunch of people to disagree with me on this one, but I think "Ocean's Twelve" is a good movie. See, the first "Ocean's" film in the modern era was meant to be an homage to the swinging sixties. When they came back to do "Thirteen," they did another sixties style film, akin to the first one. But "Twelve" is something rather different. "Twelve" is a seventies-style European movie. If you look at even the very way that 11 and 13 are shot, and compare them to 12, you'll see the difference immediately. All three films use very saturated color and bright palettes, but 11 and 13 are very crisp looking movies, whereas a lot of 12 is very grainy. 11 and 13 are going for pop, and 12 is going for a low sizzle. Much of 11 is set under the neon jungle of Las Vegas, but 12 is set all over Europe. Also, I appreciate all of the short hand that stuck around from the first movie. We get to see Danny and Rusty finishing each other's sentences, and it reinforces point that these guys know each other so very well. And the scene of all the guys arguing about how Benedict called it "Ocean's Eleven" is absolutely priceless. "It's just, I thought we agreed to call it The Benedict Job." Man, it kills me every time.